A few years ago, I couldn’t help but smile, as I watched them. Parents swinging and dipping their babies toes down into it. Little ones running, screaming, laughing as they ran through it, on that first warm day of spring. I was sitting on a bench in the heart of Chicago at the fountains. Watching how different God has made each of us, not only in our looks, but our temperament. A beautiful little girl reminded me of a duck. She was following another little girl, mimicking her every move. Even in holding up her “skirt”, while not wearing a skirt. Never did that little hand unclasp the hem of her short tee shirt. Wherever her leader went, she went also. Whatever action, she was a perfect copy. The little boy made his way about the waters on his own. Splashing whomever happened to be in his way. Running through the water falls and squealing with delight, as he came through the other side completely soaked. His mom soon joined in. Not caring at all what she looked like to others. They were in their own little world – delighting in it. Four sisters ran from one end to the other, until the youngest one was completely soaked. When they came over to their mom, who was sitting right beside me, the little girl's excitement quickly fizzled out. Her mom was reprimanding her for “not thinking long term” and getting soaked. She would have to ride in the car like that. I wanted so badly to say, “Please pick your battles. 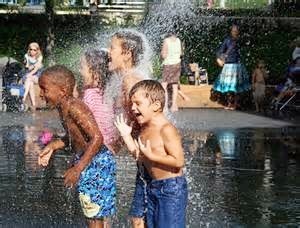 Your child will most likely remember getting “shoulded”, instead of the giggles, screams, and laughter the four of them had – getting soaked”. I kept my mouth shut and prayed. And continued to pray for all I was watching. Wondering how many of them share an intimate relationship with God or even know His name. I so want my fellow man to know Him. All the thousands of persons I saw that day, I wondered. I prayed as I walk down the streets over them. I may not have personally met them face to face, but I believe my Divine Appointment that day was to pray over them. I cannot contain my love for Him. Later, as I was sitting in Union Station waiting on my train, I looked across the room. There was a woman with two books in her lap, she was writing and turning pages back and forth. One of those books was her Bible. Another woman sitting two seats down from her, also studying her Bible. There in the middle of the city - In the middle of the crowds - He is.